There is something so magical about trying on a wedding dress for the first time. I don’t recall ever dreaming about it as a little girl or awaiting a fairytale wedding. But this was really a special first. My dress was the first thing I bought. Before finding a venue, a caterer or anything else, I found my dress. My mother, cousin (maid of honour) and her mom were all huddled on the couch in the wedding boutique. And before you knew it I was lifting the bottom of a white dress to stand on the podium in front of the mirror. It takes some time to realise that this is no party dress or cocktail number for a 21st. This is a wedding dress. The dress I would wear when marrying the man of my dreams. Totally doesn’t sink in right there and then. When I first stepped into the little boutique, I had come from a crazy day at work and felt far from the world of white and fluffy. My cousin is getting married two months before me, so as she selected a few dresses to try on, I browsed the rails. The pristine designer dresses were hung up and each one looked so crisp and clean that I hesitated touching them. The owner asked what I was looking for and it was only then that I realised I didn’t really know. 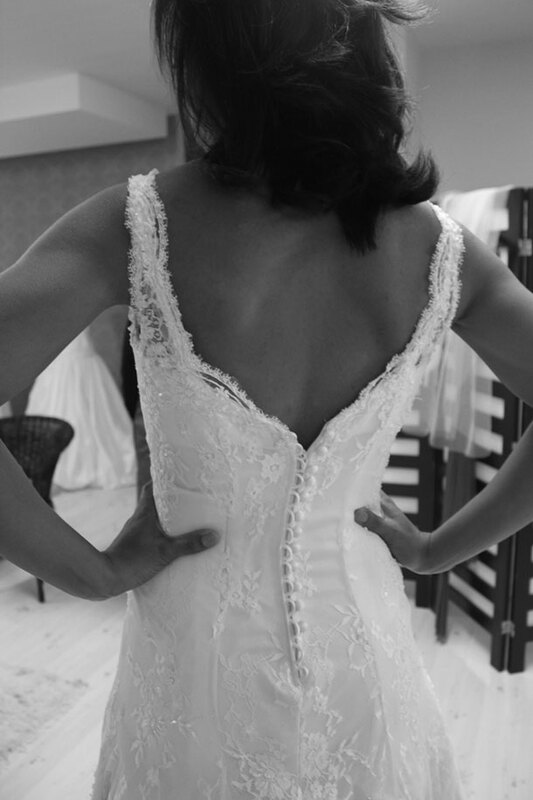 Did I want lacy straps, strapless, sweetheart neckline or empire waistline? Would the dress be snow white or slightly off-white? There were sparkling dresses perfect for a ballroom or simple, flowing ones for the beach. Too much choice always sends me into a panic, so usually when shopping I have a clear picture in my mind of what I’m looking for and I get it. I went with a style I never imagined would look best on me. And it only took two stores and a few dresses to make me realise the very first one was a winner. And that’s what is most important. What you feel comfortable and beautiful in. And one that you can afford. I didn’t bother trying on dresses that cost R12000, which would have been torture. Luckily this store was having a sale and even better, my dress had never been worn before. The best advice I can give you is: take your closest girlfriends and family with you to be your honest second eye. Wear decent underwear that can see the light of day. Believe me when I say that you’ll end up mostly naked in your delicates with the entire room to see and you want to have more than a thong on. I went to The Wedding Boutique. It’s a personal fitting in a beautiful, intimate store. The owner is wonderful, not pushy at all and really helps find what looks best on you. Check with each store before you visit, as some charge up to R300 per consultation but you can try on as many dresses as you heart desires and others charge per dress fitted to ensure they stay in tip-top condition. Photograph is of one of the beautiful dresses Lauren tried on. Thanks Tans, super excited for it! Leanne, thanks for reading! I found an article from Mark DeWitt from M Couture, a company that specialises in plus size wedding dresses. They are based in Cape Town, their number is +27 21 715 1223. I think if you google, you may find stores based near you and not just online stores for ladies with fuller figures. Good Luck! As a plus-size bride, I wish there was someone that catered for us, so we could also have the feeling and excitement you describe.